I scrawled a few thoughts into a well-used Moleskine  then rambled for seven minutes with my Zoom H6  while standing outside at a windowsill. My third level fitness trainers assure me that I burn more calories when I stand to think so that's what I do now that I've committed to dropping two stone within six months. I plan to incorporate those video clips into OfficeMix and share them with interested educators who follow #edchatie and attend our annual ICT in Education Conference on the grounds of LIT-Thurles. 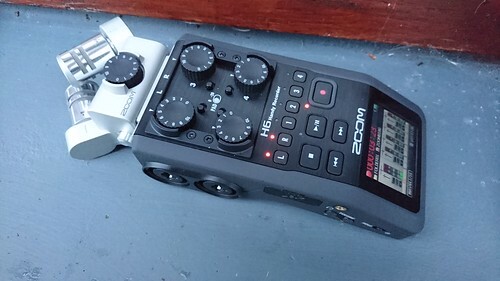 I've become very comfortable with the Zoom H6 field recorder and discovered it can make high quality audio clips from Facebook Messenger, Skype calls and simple GSM phone calls. We're going to use Skype fortnightly to contact guest speakers and bring their voices into the classroom, using either overhead speakers or Edirol bookshelf speakers that our creative multimedia students already know how to use to best effect. I need to finalise creative briefs for drone footage of the River Suir, an important feature of County Tipperary that we want to use as a centrepiece of work to complement the Memory Trail Project. I expect that it will take a month to make our Suir project very prominent in both Bing and Google search results--doing this is part of a process that we teach and learn in class. As the learning process unfolds, students will enhance their critical thinking through pages in OneNote that connect to collaborators working on the Memory Trail Project. We expect to have high quality exhibition work available in time for our annual Pen & Pixel Exhibition in May 2016. I any of these ideas interest you, please watch for updates via @topgold on all good social networks or subscribe to my blog's newsfeed. The Wondering Moleskine Project may return to form in 2016. See how the Zoom Field Recorder features in creative media. More than 1000 images and videos have auto-uploaded from my Z5 to Flickr. At the end of December, Magisto created a short video.